I scream, you scream, the whole office screams for ice cream...which is why Chunk-n-Chip came to my office! 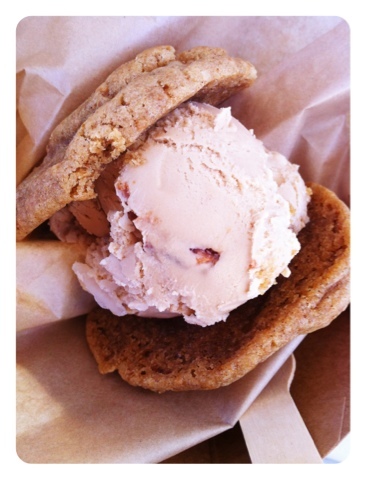 Chunk-n-Chip is a cookie ice cream sandwich truck. They have a mouthwatering menu but you can personalize your experience by creating your own ice cream sandwich choosing from the available cookie and ice cream flavors. I opted for The Great Pumpkin. I've had ice cream sandwiches from a food truck before, Cool Haus in fact, but these were a little different. The cookies were soft and warm, which made them super pliable to wrap around the monster ice cream scoops. The flavor of the cookies weren't overly pumpkin-y...although I kind of wished it was. I'm a bit of a pumpkin fiend. The ice cream was sweet from the maple but salty from the bacon bits in it, yeah, bacon bits in the ice cream. Told you it was crazy. Honestly, I kind of prefer Cool Haus over Chunk-n-Chip but that's just my personal preference. But, I do recommend you try them both out for youself!